It would be easy to be distracted by The Loft’s midmorning view. The ocean’s azure surface sparkles like a blanket of diamonds. Seabirds cruise in alluring rhythms, while the sun warms a gentle breeze wafting through a partially opened window. 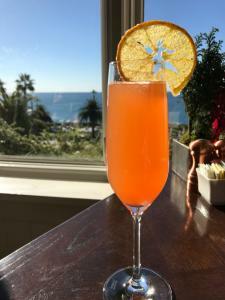 On a recent Sunday, I dropped in for brunch at The Loft at Montage Laguna Beach. Although I was initially focused on the splendor of the Pacific coastline, it wasn’t long before the dishes grabbed my attention. With plenty to choose from, the menu offered a pleasing balance of updated traditional dishes and lively surprises. 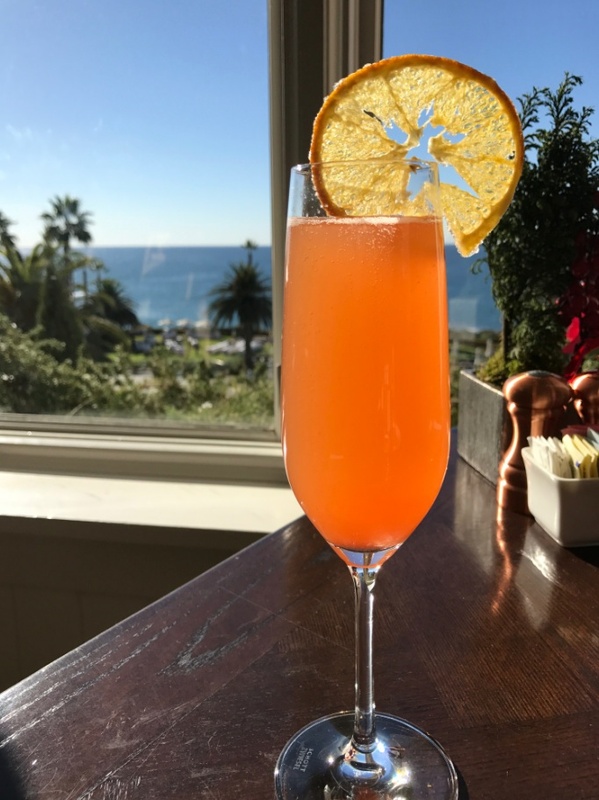 The Blood Orange Mimosa—a mix of Piper Sonoma Sparkling Wine, St. Germain Elderflower Liqueur and blood orange—got me off to an inspiring start, its lovely garnish a see-through slice of candied orange. 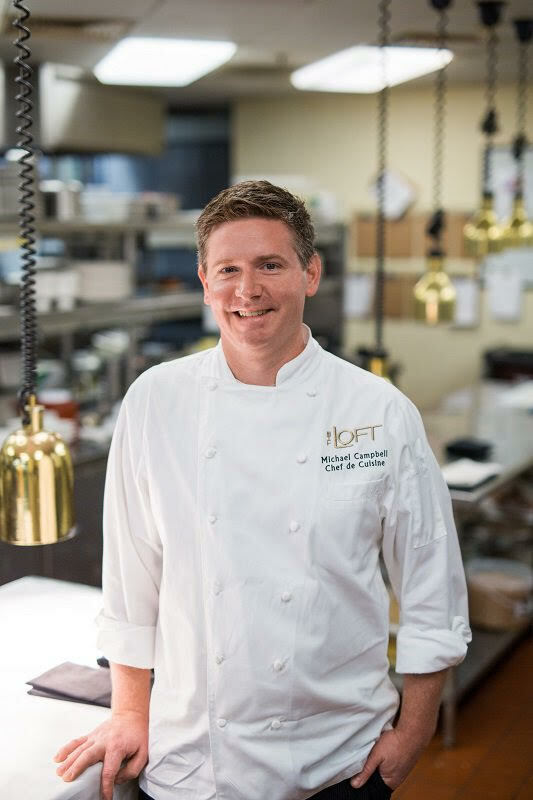 Michael Campbell, the new chef de cuisine at The Loft, started serving weekend brunch in November. He said he is so fond of creating brunch dishes that he would love to provide brunch every day. Breakfast in general has become more popular, he said, and we shared a laugh noting that McDonald’s serves breakfast all day. 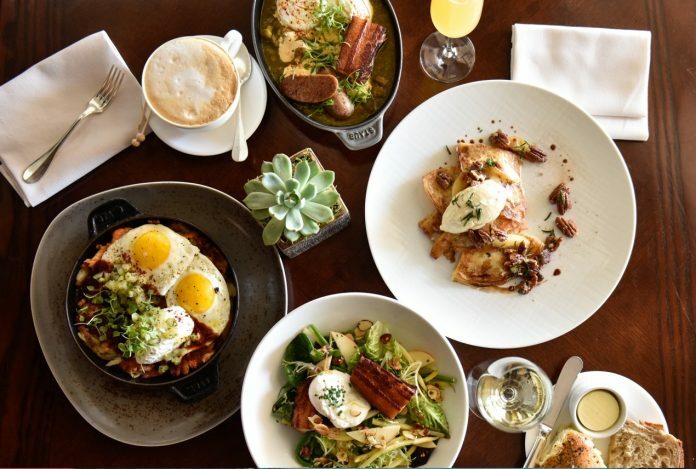 He pointed out that brunch is uniquely comforting and can be particularly successful in a hotel setting that has a generous amount of talent, creativity, and character. Friday, prep day for brunch, has become one of his favorites. He braises pork bellies, brines briskets for the following week, and smokes briskets brined the previous week; he rolls quiche doughs and sugars blueberries. 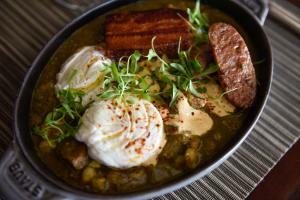 Sunday brunch seems to be a local trend as more high-end Orange County restaurants offer it. Pizzeria Ortica (Costa Mesa), Provenance (Newport Beach), and The Winery (Newport Beach) provide alluring Sunday brunch menus. Dee Nguyen’s Break of Dawn (Laguna Hills) is Campbell’s favorite brunch spot. I hungered for his dishes, having admired his talent for creating Spanish tapas with a modern twist when he was the executive chef at Pueblo, at SoCo in Costa Mesa. Trained in Catalan cuisine at Arrel Del Born in Barcelona early in his career, he showed off his Spanish-honed skills in a culinary video with me last year, creating irresistible piquillos rellenos (stuffed peppers). The dish is considered everyday fare in Spain, a concoction stuffed with cheese, meat, or seafood. His extraordinary version used cod, a delectable blend of his childhood roots in Baltimore and his experience working the line in that eatery in Barcelona. Perusing the menu, there were small hints of Spanish influence: a Spanish Frittata (tortilla Espanola) showcasing potato, peppers, and Manchego cheese, along with smoked paprika used in a crema topping as well as lightly sprinkled as a garnish on some other egg dishes. Perhaps a bigger influence was his time in the Pacific Northwest where he worked with chef Cory Schreiber for one year at Wildwood in Portland, Ore. (Sadly, it’s now closed.) Schreiber showed Campbell how to use fresh ingredients and see them through with integrity and simplicity. Respect for the best ingredients was evidenced in every dish I ate. His tweaks created delicious flavor bonuses even in the most conventional dishes. Blueberry pancakes, golden yellow from high quality eggs and butter, were served with vanilla whipped cream and maple syrup. The blueberries were nuanced in texture and taste by a simple step in preparation. They had been dusted with granulated sugar and allowed to rest long enough to have a little crunchy surface develop; in the mouth the berries popped yielding bountiful sweet-tart juices. “Playful” is a word Campbell used to describe the creative changes that he makes to many traditional dishes. Instead of Canadian bacon in the Montage Benedict, he substituted a more appealing option, crispy mortadella. His Croque Madame (my favorite rendition that I’ve sampled on this side of the Atlantic) was augmented with prosciutto (instead of ham) and creamy spinach. Most often, brunch menus don’t include starters. At The Loft, the menu offered shared-plate style “appetizers.” The dazzling California Avocado Toasts included three crisply toasted slices of sourdough bread generously topped with mashed avocado and a salad-like mix of arugula, baby basil, halved cherry tomatoes, and slices of hard-cooked eggs. I’m a big fan of texture contrasts, so the oh-so-crunchy surface of the Pastrami Hash was the first thing that won me over on this vibrantly flavored dish. Campbell told me the whole shebang is inverted on a plancha (super-hot griddle) to give it a good toasting. The irresistible Pork Shoulder Chile Verde, a stew-like concoction that showed off very-tender chunks of smoked pork adrift in a tasty tomatillo and poblano sauce, had just-right spiciness and acidity. Atop the mix, smoked paprika cream teamed with poached eggs. Gorditas made a scrumptious accompaniment, both in flavor and texture. Prepared with fresh masa, these 3/8-inch-thick tortilla-like wonders were fresh off the grill. I love brunch and have vowed to enjoy it more often. It’s a luxurious twofer that means I don’t have to cook breakfast or lunch. Nice.